Our first stop in the morning was Bonanza Falls. I spent most of my time this trip taking intimate photos of the waterfalls. We headed out early in the morning to catch the sunrise at Bonanza Falls. As I mentioned in an earlier blog there was more water than normal flowing over the falls. What really makes Bonanza falls so interesting is the large number of small waterfalls that can be found flowing over the upturned rock formations. After taking a few photographs before the sun came up we decided to find the fisherman’s trail along the river and look for some some more waterfalls before the sun reached the far shore. 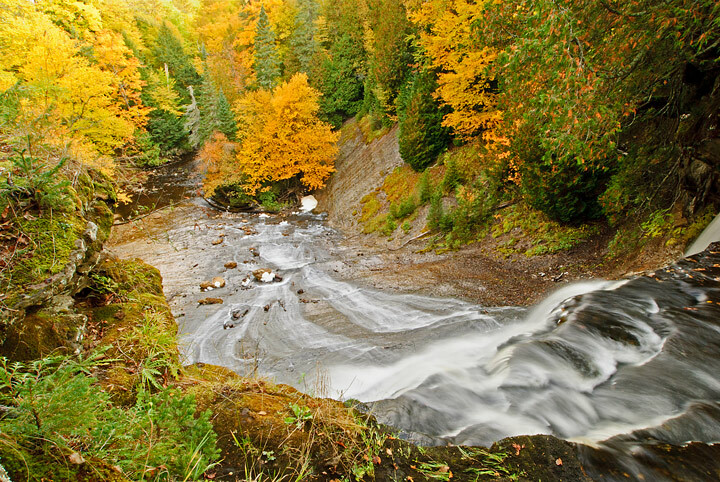 Overnight we had a chance to read the Waterfalls of Michigan by Phil Stagg and he indicated there were a few more falls to be found. We had visited Bonanza Falls many time but had never walked down stream. A side benefit of walking down the fisherman’s trail was finding an easier way to reach the river. In the past we had climbed down the steep embankment but it had become more difficult over time. We did find a couple of nice waterfalls. The sun was starting to hit the far shore so we walked back to the main falls area for a few last photographs. After getting a bite to eat we drove out to Bonanza Falls to photograph at sunset. 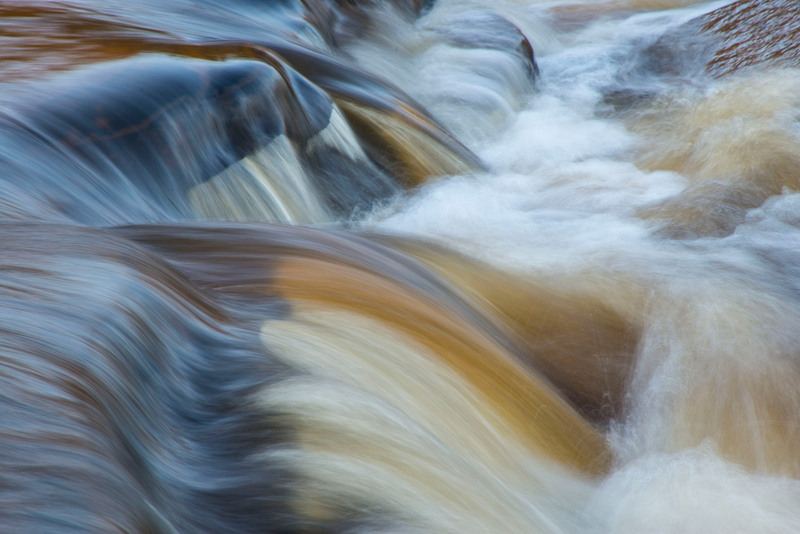 As I had mentioned in earlier blogs there was a lot of water flowing in the rivers. Bonanza Falls also had more water than normal. Generally I like less as opposed to more water flowing because it provides more opportunities for intimate shots of the waterfalls. 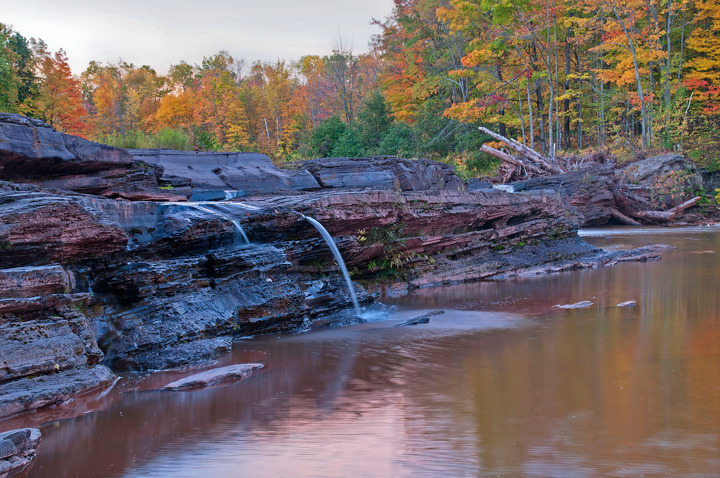 Most of the waterfalls in the Marquette and Munising area. It is generally easy to visit them on a short trip. The two outliers are Haven Park which is over by Calumet and Tahquamenon Falls which is near Paradise, Michigan. 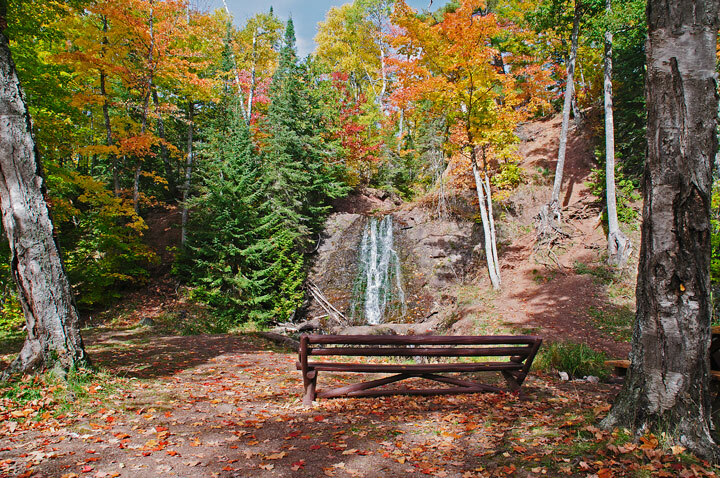 Bonanza Falls is located near Silver City just outside of Porcupine Mountains Wilderness State Park. It is really several small waterfalls. 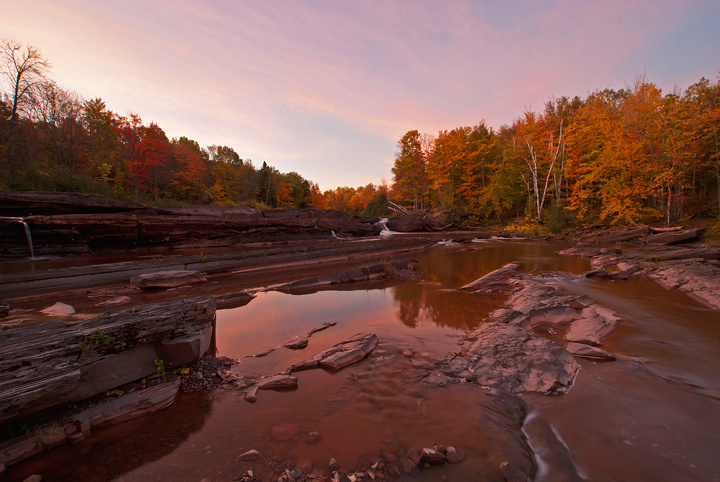 If the water levels are low it is easy to walk out into the Iron River to photograph the falls. I like to photograph them late in the evening and early in the morning. 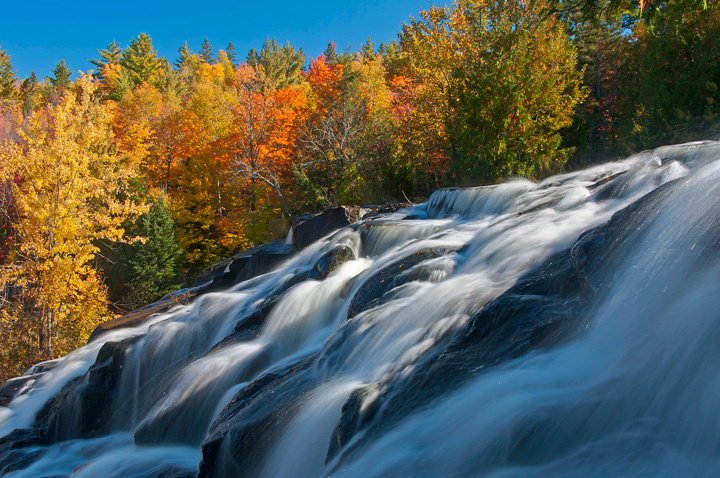 Bond Falls is my favorite waterfall in the UP. 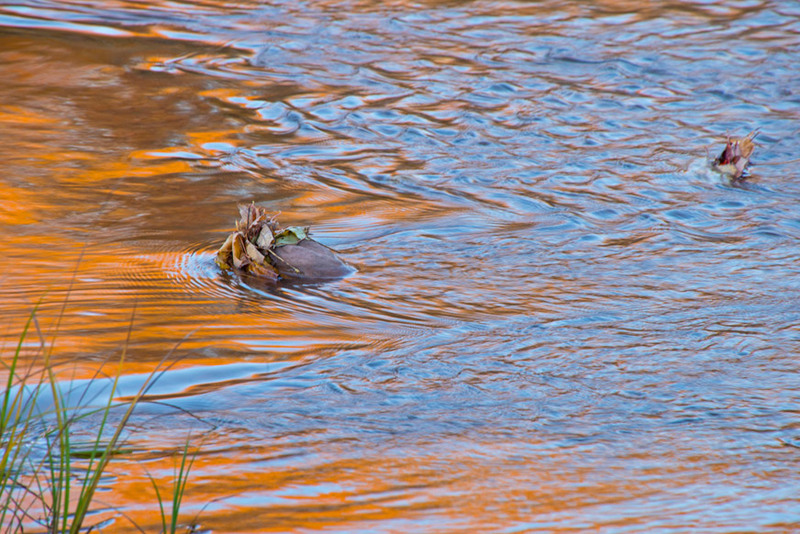 It can be photographed any time of the year and provides some excellent photography opportunities. It is particularly popular in the fall when you may need to stand in line at some locations because of their popularity. Canyon Falls is located just up the road from Bond Falls. 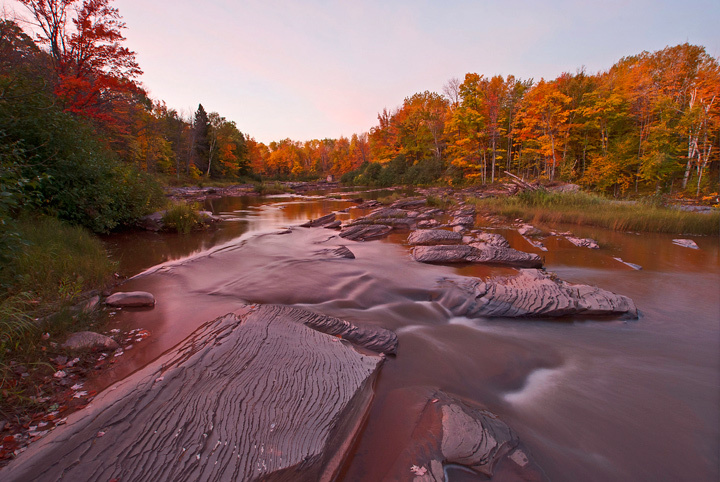 It is located on the Sturgeon River. 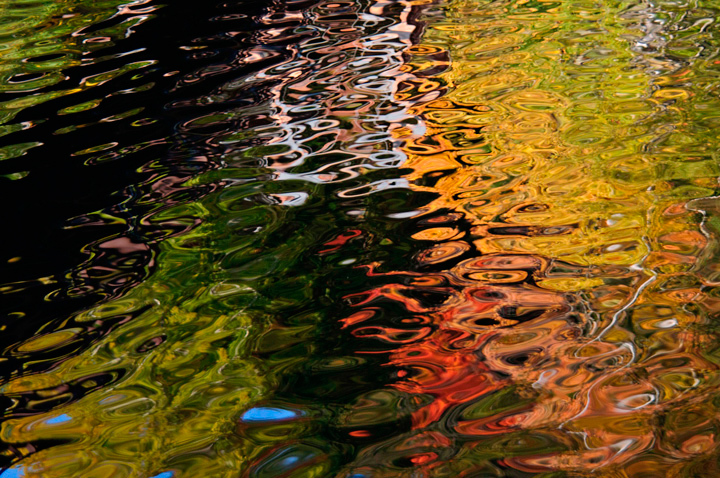 I’ve only been able to hit the peak color along the river once but it was very impressive on that visit. 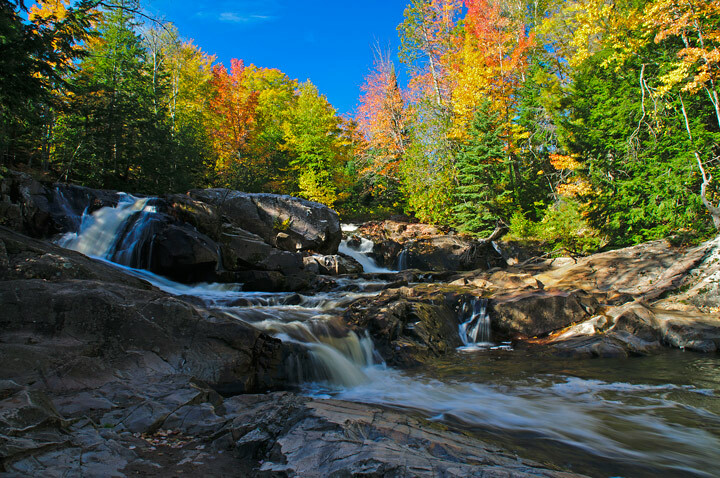 Yellow Dog Falls is located near Marquette, Michigan. It is reached on a long dirt road followed by about a mile hike to the first of the waterfalls. 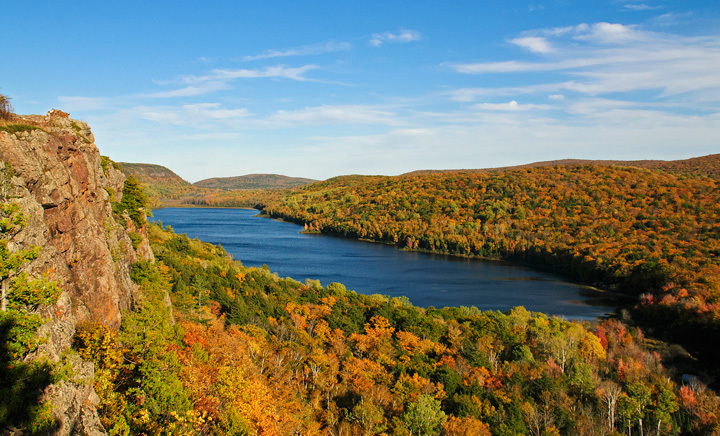 The drive to the falls is spectacular during the fall color season. Laughing Whitefish Falls is located between Munising and Marquette. It is a very impressive waterfall when there is sufficient water flowing over the falls. Some years the dirt road into the falls is filled with large potholes. Haven Park Falls is one of the outliers. 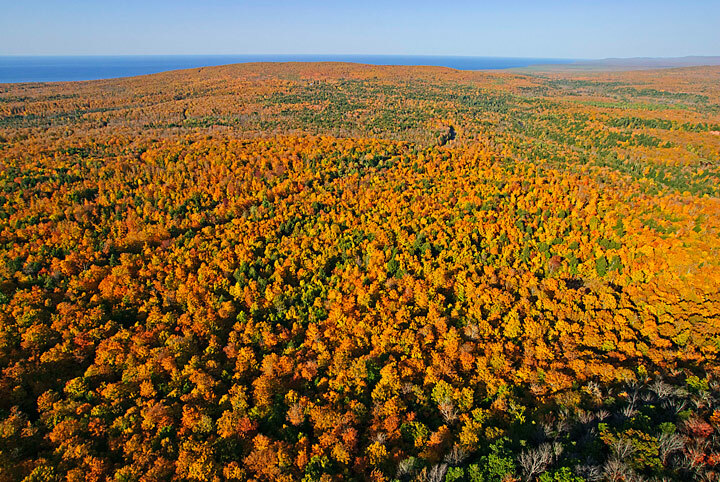 It is located in Lac La Belle, Michigan. 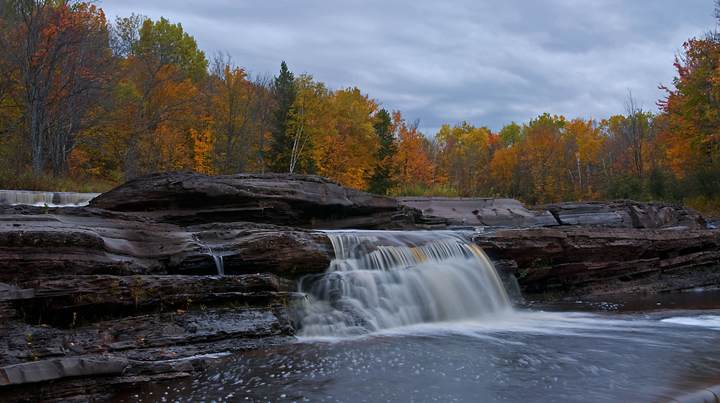 It is not all that spectacular as a waterfall but it is a beautiful location for photographing the fall colors. 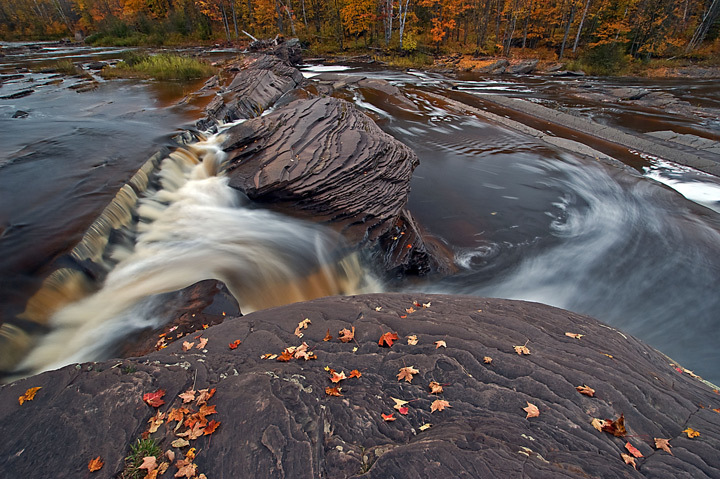 Tahquamenon Falls is another outlier located near Paradise, Michigan. As a waterfall it is the largest and most spectacular. It is very popular in the fall. One day I counted cars from 16 different states in the parking lot. Bonanza Falls is located just outside Silver City, Michigan on the Big Iron River. 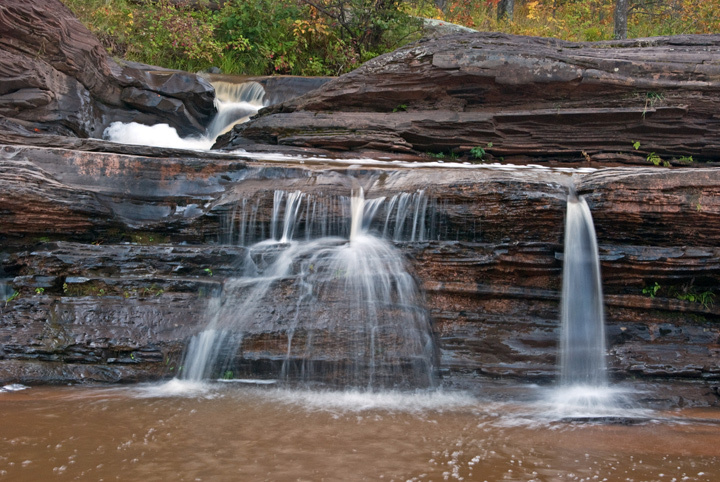 I had driven by these wonderful little falls many times on my travels through the U.P. but had never stopped. For some reason I had it confused with another waterfall that was difficult to find. I thought I the falls could only be reached with 4WD vehicle over a few miles of rough roads. One morning after a visit to Lake of the Clouds, in Porcupine Wilderness State Park I had some time to kill so I decided to try and make it to Bonanza Falls. Turns out the Falls is about 150 yards off of the main road. What a surprise! I spent about an hour walking around the falls taking photographs. 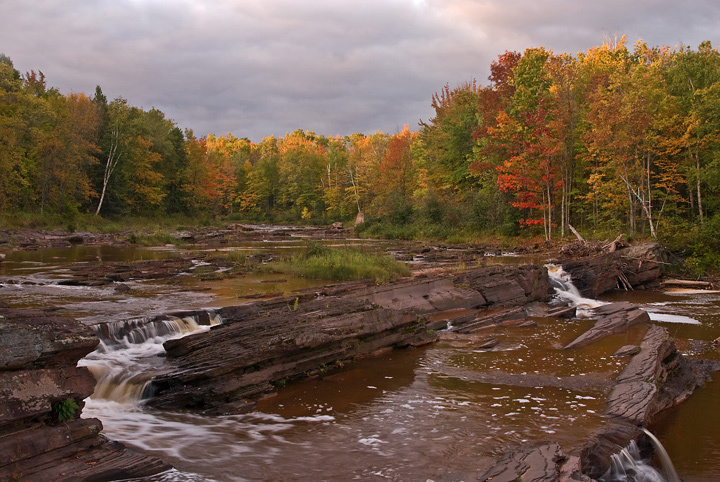 As I looked at the view across the Big Iron River I noticed a little color in the trees and thought this would be a great place to take some fall photographs. This photo is from a later visit in the fall. On a subsequent trip to the area I had planned to drive out to Union Bay to Photograph the Sunset. Unfortunately as I neared Union Bay I realized that the heavy overcast was not going to clear. I decided to stop at Bonanza Falls. 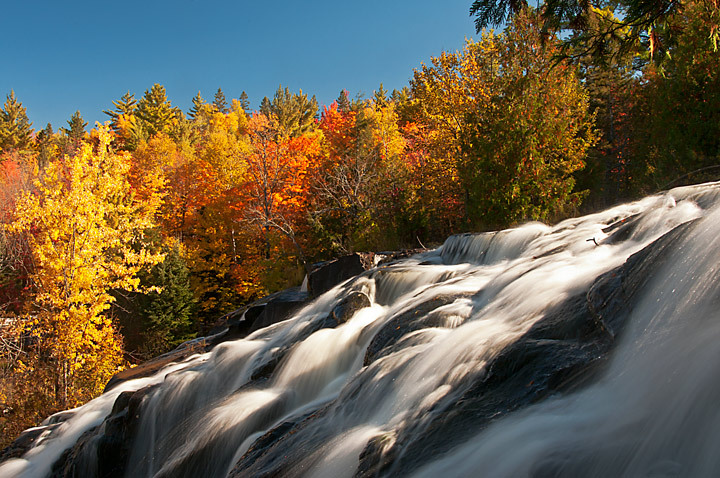 The low light levels allowed me to capture some amazing fall photographs of the falls. On another Visit to the I drove up to Lake of the Clouds to photograph the sunrise. Unfortunately it was cloudy and the wind was so strong that I could barely keep the tripod upright. I decided to pack it in and started back to my motel in White Pine. As I neared Bonanza Falls I noticed that there was a little clearing in the clouds and some nice light. I pulled in to Bonanza falls to have a look. There were some great clouds and light. What is so amazing about photographing at Bonanza Falls is that if you hit it at the right water levels there will be many small waterfalls and pools of water winding through and over the rock uplifts that you can photograph. 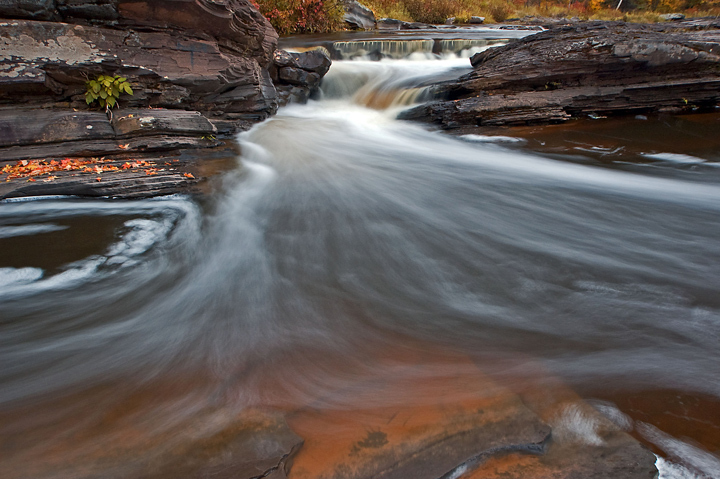 The site has two main falls Bonanza and at the west side of the river Greenwood. In between there are many other falls to photograph. The areas is also interesting because of the rock uplift. 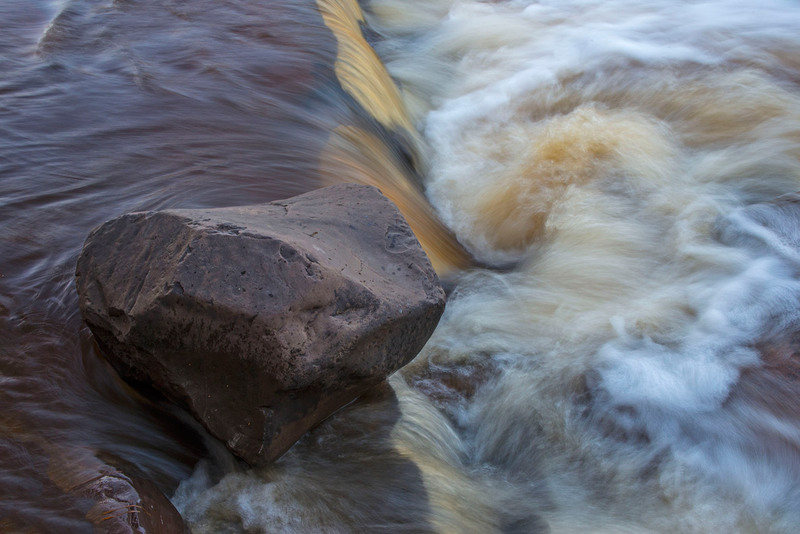 the rocks at the bottom of the river are uplifted at a severe angle. 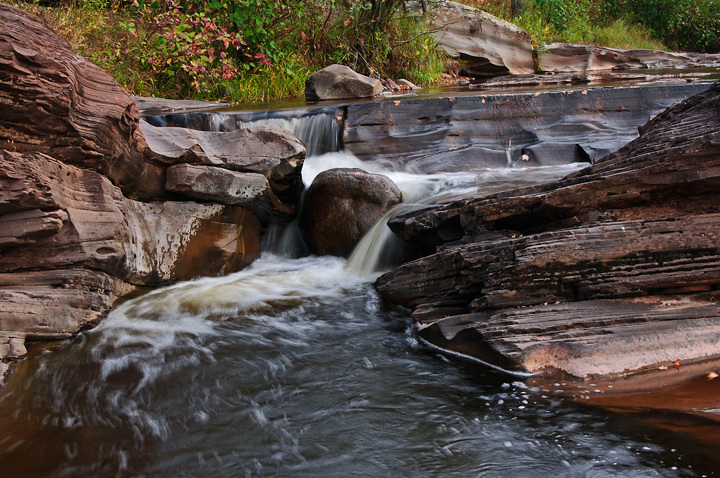 In the right conditions you can almost walk across the Big Iron River on the uplifted rock photographing small waterfalls all along the way. More Photos of the area can be found on my website.